Below you fill find all funeral homes and cemeteries in or near Cleveland. Popular neighborhoods in Cleveland include: Collinwood, Detroit-Shoreway, Downtown Cleveland, The Flats, Glenville, Little Italy, Old Brooklyn, Buckeye-Shaker, Slavic Village, St. Clair-Superior, University Circle, Warehouse District, West Park, Brooklyn Centre, Hough, Cleveland, Ohio City, Tremont, and Cleveland. We were established in 1921 by C. B. Miller. We have served the Greater Cleveland community for 95 years. We are now the Miller McFall Roger Funeral home. We have been serving the Greater Cleveland community since 1921 when my father C. B. Miller started the business. We have been in our present location for over 70 years. Suburbs of Cleveland: ield Hts, Orange Village, Shaker Heights, Shaker Hts, Bedford Heights, Bedford Hts, Brooklyn Heights, Euclid, Highland Hills, Highland Hls, Mayfield, Mayfield Hts, Newburgh Heights, Newburgh Hts, Pepper Pike, South Euclid, University Heights, University Ht, Valley View, Warrensville Heights, Warrensville Hts, Warrensvl Hts, Ameritrust Bank, Bratenahl, Briggs, BRM Unique Firm ZIP, Broadview Hts, Brooklyn, Brooklyn Hts, Brookpark, Cleveland Clinic Foundation, Cuyahoga Hts, Edgewater, Fairview Park, Fairview Pk, Firestone Tire & Rub Co, Garfield, Glenwillow, Highland Heights, Highland Hgts, Highland Hts, Huntington Bank, Key Bank, Key Corp, Linndale, Lyn May, Lyndhurst, Lyndhurst Mayfield, Maple Hts, Mayfield Heights, Mayfield Village, Mayfield Vlg, Middlebrg Hts, Middleburg Heights, Middleburg Hts, Midpark, N Royalton, National City Bank, Noble, North Randall, Oakwood Village, Oakwood Vlg, Olmsted Twp, Parkview, Parma Heights, Puritas Pk, Richmond Heights, Richmond Hts, Riveredge, Seven Hills, Shore, Unique Firm Zip, University Hts, Walton Hills, Woodmere. Cleveland is also known as: The Forest City and Cuyahoga County / Cleveland city. Their current mayor is Mayor Frank G. Jackson. Zip codes in the city: 44101, 44102, 44103, 44104, 44105, 44106, 44107, 44108, 44109, 44110, 44111, 44112, 44113, 44114, 44115, 44116, 44117, 44118, 44119, 44120, 44121, 44122, 44123, 44124, 44125, 44126, 44127, 44128, 44129, 44130, 44131, 44132, 44133, 44134, 44135, 44136, 44137, 44138, 44139, 44140, 44141, 44142, 44143, 44144, 44145, 44146, 44147, 44149, 44181, 44188, 44190, 44191, 44192, 44193, 44194, 44195, 44197, 44198, 44199. Cuyahoga County funeral flowers can be purchased from one of the local funeral shops we partner with. There are currently 171 funeral options for this city. Cleveland has been featured in films like: The Deer Hunter (1978), A Christmas Story (1983), Spider-Man 3 (2007), and Last Son (2009). Some of the notable people born here have been: Nicole Marie Lenz (actor and model), , , , Carl E. Walz (engineer and astronaut), Gregory J. Harbaugh (engineer and astronaut), Mary Ellen Weber (engineer and astronaut), G. David Low (engineer and astronaut), Donald A. Thomas (engineer and astronaut), and Jack Thompson (lawyer). Cleveland is home to the following sports teams: Cleveland Indians, Cleveland Browns, and Cleveland Cavaliers. Cleveland (/ˈkliːvlənd/ KLEEV-lənd) is a city in the U.S. state of Ohio and the county seat of Cuyahoga County, the most populous county in the state. The city is located in northeastern Ohio on the southern shore of Lake Erie, approximately 60 miles (97 km) west of the Pennsylvania border. It was founded in 1796 near the mouth of the Cuyahoga River, and became a manufacturing center owing to its location on the lake shore, as well as being connected to numerous canals and railroad lines. Cleveland's economy has diversified sectors that include manufacturing, financial services, healthcare, and biomedical. 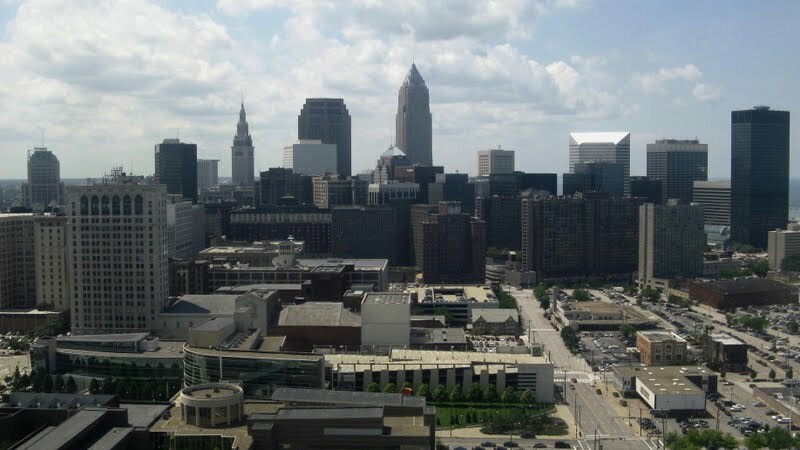 Cleveland is home to the Rock and Roll Hall of Fame and the Cleveland Clinic.As of the 2013 Census Estimate, the city proper had a total population of 390,113, making Cleveland the 48th largest city in the United States, and the second largest city in Ohio after Columbus. Greater Cleveland, the Cleveland-Elyria-Mentor, OH Metropolitan Statistical Area, ranked 29th largest in the United States, and second largest in Ohio after Cincinnati with 2,064,725 people in 2013. Cleveland is part of the larger Cleveland-Akron-Canton, OH Combined Statistical Area, which in 2013 had a population of 3,501,538, and ranked as the country's 15th largest CSA.Residents of Cleveland are called "Clevelanders". Nicknames for the city include "The Forest City", "Metropolis of the Western Reserve", "The Rock and Roll Capital of the World", "C-Town", and the more historical "Sixth City". Due to its proximity to Lake Erie, the Cleveland area is often referred to locally as "The North Coast". It was revealed by Canton Observer on March 24th, 2019 that Frances Mcginnis "Fran" Hayes passed away in Birmingham, Michigan. Hayes was 87 years old and was born in Cleveland, OH. Send flowers to share your condolences and honor Frances Mcginnis "Fran"'s life. It was disclosed on March 23rd, 2019 that Michael Joseph Gima perished in Spring Hill, Florida. Gima was 74 years old and was born in Cleveland, OH. Send flowers to express your sympathy and honor Michael Joseph's life. It was noted by New Bern Sun Journal on March 20th, 2019 that Dollena Blase died in New Bern, North Carolina. Blase was 93 years old and was born in Cleveland, OH. Send flowers to express your sympathy and honor Dollena's life. It was disclosed by Sarasota Herald-Tribune on March 19th, 2019 that Barbara Bell Smith died in Sarasota, Florida. Smith was 93 years old and was born in Cleveland, OH. Send flowers to express your sympathy and honor Barbara Bell's life. It was reported by Register Guard on March 17th, 2019 that Lawrence Snortland passed on in Lane Co, Oregon. Snortland was 78 years old and was born in Cleveland, OH. Send flowers to share your condolences and honor Lawrence's life. It was reported by Sarasota Herald-Tribune on March 16th, 2019 that Donald Richard "Don" Lucas died in Sarasota, Florida. Lucas was 81 years old and was born in Cleveland, OH. Send flowers to express your sympathy and honor Donald Richard "Don"'s life. It was written by Register Herald on March 15th, 2019 that Ronald Nelson Rose died in Sophia, West Virginia. Rose was 57 years old and was born in Cleveland, OH. Send flowers to share your condolences and honor Ronald Nelson's life. It was noted by Des Moines Register on March 12th, 2019 that Gerald J "Jerry" Hewus perished in Iowa. Hewus was 80 years old and was born in Cleveland, OH. Send flowers to share your condolences and honor Gerald J "Jerry"'s life. It was noted on March 11th, 2019 that Barbara J miss Allender passed on in Tampa, Florida. Allender was 77 years old and was born in Cleveland, OH. Send flowers to express your sympathy and honor Barbara J miss's life. It was written by Register Guard on March 10th, 2019 that Ralph Joseph Barnhard perished in Eugene, Oregon. Barnhard was 81 years old and was born in Cleveland, OH. Send flowers to share your condolences and honor Ralph Joseph's life. Cleveland funeral homes are what we do. We can assist you in your search for funeral homes, funeral planning services and more. Browse below to discover the Cleveland funeral home nearest to you, or one that best fits your needs. We can point you to the funeral home that can provide you with all of the funeral arrangements necessary, even sending funeral flowers. When it comes to Cleveland funeral planning, iMortuary is your trusted resource for all funeral services. Resting on the southern shore of Lake Erie, Cleveland, Ohio is a diverse and culturally rich city with a passion for professional sports. Starting as a major manufacturing center due to the railroads and canals near the mouth of the Cuyahoga River, Cleveland matured into a service economy after the decline of heavy manufacturing. With insurance, financial services and healthcare driving the economy, The North Coast residents are able to enjoy its Playhouse Square Theater and Rock and Roll Hall of Fame. These 'Clevelanders' have been on the decline, loosing almost 400,000 Cleveland residents in the past decade. The official website for the city of Cleveland is http://www.city.cleveland.oh.us/. We work with local florists and flower shops to offer same day delivery. You will find budget sympathy flowers in Cleveland here. Our funeral flowers are cheap in price but not in value.